Over the years, the European nuclear medicine/radiopharmaceuticals market has witnessed various advancements in radiopharmaceuticals. The European radiopharmaceuticals market is witnessing growth owing to an increasing number of radioisotope approvals for different clinical indications. Tc-99m and F-18 radioisotopes are estimated to contribute the highest to the European nuclear medicine diagnostic market in 2015, whereas Ra-223, I-131 and Y-90 ensured their leading position in the therapeutic market. In 2015, the diagnostic segment accounts for the largest share of the European nuclear medicine/radiopharmaceuticals market, by type. The SPECT segment accounts for the largest share of the diagnostic radiopharmaceuticals market, while the beta emitters segment accounts for the largest share of the therapeutic radiopharmaceuticals market. In 2015, Germany accounts for the largest share of the European nuclear medicine/radiopharmaceuticals market, followed by France, Italy, U.K., Spain, Russia, and the Rest of Europe (RoE). In the coming years, the European nuclear medicine/radiopharmaceuticals market is expected to witness the highest growth in the Rest of Europe, especially in Switzerland, Poland, Denmark, Sweden, and The Netherlands. The European nuclear medicine/radiopharmaceuticals market witnesses high-competitive intensity as there are several big and many small firms with similar product offerings. These companies adopt various strategies (agreements, contracts, acquisitions, market developments, expansions, website launch, marketing and promotional activities, and technological enhancements) to increase their market shares and to establish a strong foothold in the European market. Radiopharmaceuticals are drugs that contain radionuclide-emitting ionizing radiation, used in the nuclear imaging field to diagnose and treat various diseases. The European nuclear medicine/radiopharmaceuticals market is segmented on the basis of types, applications, and countries. The radiopharmaceuticals market, by type is broadly classified into two segments, namely, diagnostic and therapeutic. Radioisotopes in the diagnostic market are categorized as SPECT and PET; while the therapeutic market is classified into beta emitters, brachytherapy isotopes, and alpha emitters. In 2015, the diagnostic segment accounts for the largest share of the European nuclear medicine/radiopharmaceuticals market, with the SPECT segment accounting for the largest share of the diagnostic market. Based on application, the European nuclear medicine/radiopharmaceuticals market is segmented into SPECT, PET, and therapeutic applications. Factors such increasing preference for SPECT and PET scans, advances in radiotracers, Alpha radio immunotherapy-based targeted cancer treatment, increasing incidence and mortality rate of cancer and cardiac ailments are driving the growth of European Nuclear Medicine/Radiopharmaceuticals market. Moreover, potential radioisotopes in the pipeline, cyclotron based production are likely to create huge opportunities for European Nuclear Medicine/Radiopharmaceuticals market in the coming years. However, factors such as shorter half-life of radiopharmaceuticals, competition from conventional diagnostic procedures are hindering the growth of European Nuclear Medicine/Radiopharmaceuticals market. On the basis of countries, European Nuclear Medicine/Radiopharmaceuticals market is classified into Germany, France, Italy, U.K., Spain, Russia, and the Rest of Europe (RoE). The European nuclear medicine/radiopharmaceuticals market is expected to reach $1.62 Billion by 2020 from $1.09 Billion in 2015, growing at a CAGR of 8.2% from 2015 to 2020. 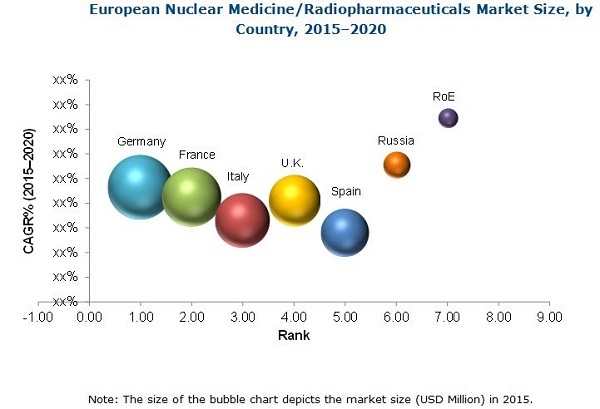 European Nuclear Medicine/Radiopharmaceuticals market is dominated by Germany, followed by France, Italy, Italy, U.K., Spain, Russia, and the Rest of Europe (RoE). Rest of Europe (RoE) is expected to grow at the fastest rate during the forecast period. Some of the major players in the European nuclear medicine/radiopharmaceuticals market include Cardinal Health Inc. (U.S.), GE Healthcare (U.K.), Bracco Imaging S.p.A (Italy), Eczacibasi-Monrol Nuclear Products (Turkey), Nordion, Inc. (Canada), Advanced Accelerator Applications S.A. (France), Bayer Healthcare (Germany), Lantheus Medical Imaging, Inc. (U.S.), IBA Molecular Imaging (Belgium), and Mallinckrodt plc (Ireland). 12.4 Lantheus Medical Imaging, Inc.
12.9 Advanced Accelerator Applications S.A.